Podcasts do not truly belong on Youtube, and you most likely should not be putting your episodes on that video platform. Most podcasts are audio and by putting them on YouTube you are risking your content rights, channel and more. Daniel J. Lewis explains why podcasters should shy away from this practice. 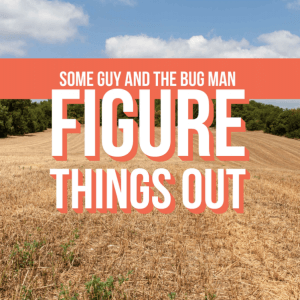 The two hosts, Chase and Bradley, of the show Some Guy and the Bug Man joined MacKenzie to discuss the multiple reasons why YouTube can hurt your podcast and share information on their show(s). Both shows in the Some Bug Man Studio are quick and to the point. They’re hoping to make some changes soon. Lastly, the group talks about how Blubrry is now offering submissions to Spotify to it’s hosting customers. Stick around for the PowerPress tip at the end of the episode, courtesy of Shawn Thorpe. Thanks for listening and please subscribe via your favorite podcast platform. Want to be on the show? Email MacKenzie and tell her why you think you would be a great fit. Some Guy and the Bug Man: Listen to their episodes here. Get on Spotify via Blubrry: Hosting customers only. Your latest podcast episode is brilliant! Just like the ones before it. Now it’s time to push it out to your fan base and prospective new audiences. Everyone shares their new podcast episode on their social media accounts, right? If not, well, they should. That’s why we’re proud to introduce Post to Social, which enables Blubrry hosting podcasters to easily share their episodes on Twitter, YouTube and Facebook (with more options in the works). Post to Social for Twitter, YouTube and Facebook makes it easy to publish two-minute podcast clips of episodes or episode teasers to your social media accounts. By automatically publishing your episodes with P2S you’re giving listeners a short sample of your episode with an outro that encourages listeners to check out the full episode. The new feature provides you the capability to almost instantly post your entire show to Twitter because it enlists a Twitter audio card. And YouTube and Facebook will post the first two minutes of the episode: content creators can record an outro, driving listeners to the full episode on their own site. Studies show that YouTube and Facebook users are more likely to listen to a short audio segment versus a full audio segment, which is why we’ve created the podcast teasers with your outro. Your outro can be something such as, “Head over to [your podcast location] to hear the rest of this episode, and be sure to subscribe while you’re there.” This is a great way to drive traffic to your website or whatever destination you want your listeners to visit. Blubrry hosting users can use Post to Social now — instructions are posted on the Blubrry website. If you’re not yet hosting with us, sign up here to get the added benefit of Post to Social for your podcast. 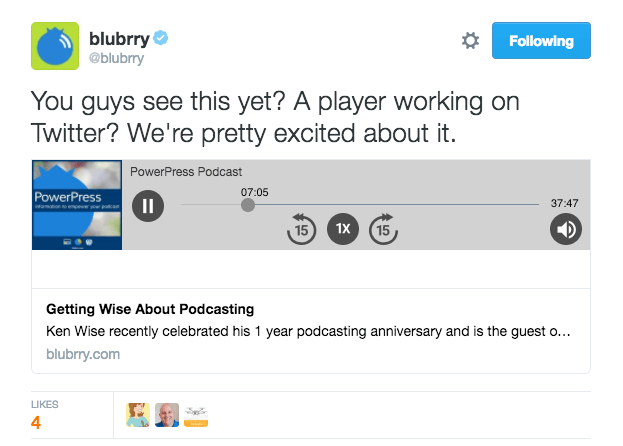 Version 1.0 of Blubrry PowerPress Podcasting plugin for WordPress is now available. The latest version includes a number of new features/options as well as a settings pages redesign based on user feedback. With this update, PowerPress now includes all of the key features found in PodPress. The new Password Protection for the Custom Podcast Channels feature is a replacement for the PodPress Premium Content feature.Â Unlike PodPress’ Premium Content feature, Blubrry PowerPress Password Protection for Custom Podcast Channels has no limit. You can create as many custom podcast channels with password protection as you want (each with its own RSS feed). The new “Verify” button is an enhanced replacement of the “Detect” buttons found in PodPress. The Verify button goes beyond detecting only the file size and duration, it also confirms that the Media URL entered is formatted correctly and is valid. The new Verify button does all this with only one click. PowerPress now includes the highly requested 1 Pixel Out Audio Player used by PodPress. PowerPress includes the latest version, which features volume control. We are committed to providing a well developed and mature podcasting plugin for WordPress. Please let us know what you think,Â leave any feature suggestions in a comment below and/or let us know directly with our contact us form. PowerPress 0.9 Released: Someone Ask for More Options? The Blubrry PowerPress plugin for WordPress version 0.9.2 is now available. The latest version includes a large number of new features/options as well as a small number of bug fixes. The latest version can be downloaded here. We added courtesy functions for theme developers to use in the event they are stripping the player from the page content or excerpt. To use the functions, add the following code to your theme template where you would like to display the PowerPress players and links. We are committed to providing a well developed and mature podcasting plugin for WordPress. Please let us know what you think and/or leave any feature suggestions in a comment below, or let us know directly with our contact us form.